After losing the last two games in a row, the Wizards returned home tonight with hopes of finally shaking off the unbeatable Celtics, who seem to have their number over the past few seasons. Tonight, it took extra time to end this battle… one shot by Kyrie Irving and down go the Wizards. 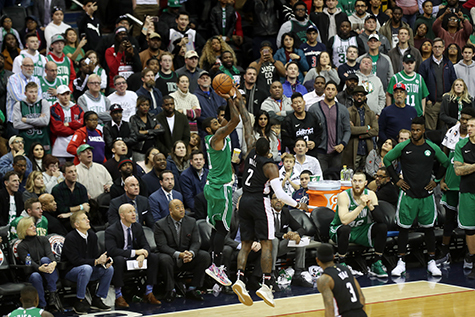 Irving took it upon himself to battle with John Wall back and forth in the overtime period, but it was the one final three pointer that was the difference in the game. Part of his 12 points in the overtime period as well. This is one of the few games where the Wizards have had a will at the end and instead of folding, they came at the Celtics hard when it mattered, so much John Wall re-entered the game after taking a hard fall with Irving, just so he could give his team a shot of making it a game that went the Wizards way.